The Prime Minister, Shri Narendra Modi addressing at the Global Entrepreneurship Summit-2017, in Hyderabad on November 28, 2017. 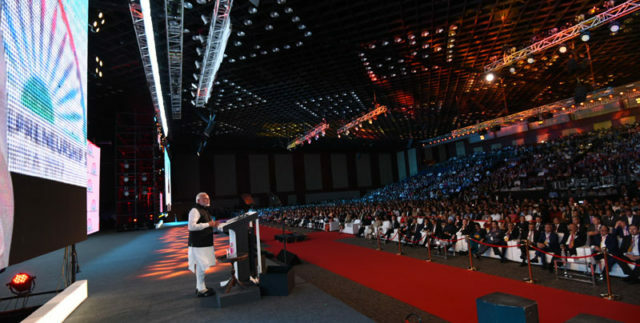 Hyderabad: PM Narendra Modi inagurates Global Entrepreneurship Summit, 2017. The theme “Women First, Prosperity for All” makes this edition of GES stand out. In Indian mythology, woman is an incarnation of Shakti – the Goddess of power. We believe women empowerment is vital to our development. Our history has references to women of remarkable talent and determination. Gargi, an ancient philosopher, around the seventh century BC, challenged a male sage to a philosophical discourse – something unheard of in those times. Our warrior queens like Rani Ahilyabai Holkar and Rani Lakshmibai fought bravely to defend their kingdoms. Our freedom struggle too is replete with such inspirational instances. We have created Aadhaar – the world’s largest biometric based digital database. This currently covers over 1.15 billion people and digitally authenticates over 40 million transactions daily. We now digitally provide monetary benefits of various government schemes to the beneficiaries through Direct Benefit Transfer using Aadhaar. To my entrepreneur friends from across the globe, I would like to say: Come, Make in India, Invest in India – for India, and for the world. I invite each one of you to become a partner in India’s growth story. And once again assure you of our whole-hearted support.